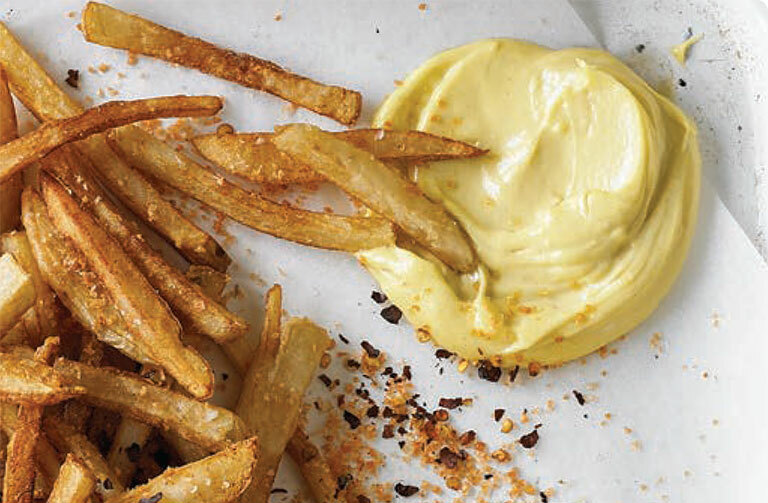 A condiment that goes great with fried foods. Place garlic on a 10cm square of aluminium foil, drizzle with olive oil and season with salt and pepper. Wrap to enclose garlic. Put aioli into a bowl and cover with plastic wrap. Add hickory wood chips to the burn chamber of the Breville Smoking Gun. Place hose under plastic wrap with the opening sitting above the aioli. Seal with plastic wrap. Turn smoking gun on to HIGH SPEED and ignite wood chips. Switch to LOW SPEED and smoke for a few seconds until the bowl is filled with a dense smoke. Remove hose and reseal plastic wrap. Let infuse for 3 minutes. Repeat process one more time for a smokier flavour, stirring aioli between each session. Cover and refrigerate until needed.